There are a myriad of references to King Arthur and The Knights of the Round Table in TFA. After watching this video it is so obviously blatant. With regards to one of your questions yesterday, this thread has some discussion on Salad Bowl & KOR if you're still searching around for more information on him. But I believe Salad Bowl was discussed in a few threads back in 2016 & 2017, though, so you may still need to do some searching through the forum. Thank you! I actually found the thread after someone said there was one following my previous post. There is some great information and theories here about the Knights of Ren. Salad Bowl was as I read elsewhere a clan leader. 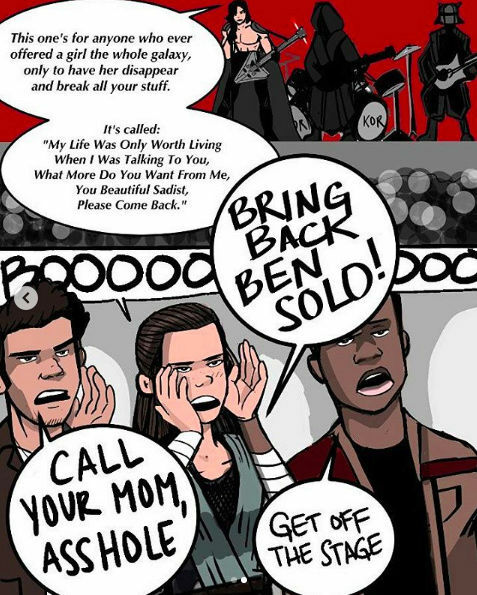 But I thought there would be more theories on Kylo saving Rey by striking down Salad Bowl. There was a couple of posts acknowledging the action on the thread, but that's it. What if, in the first part of the vision when Rey sees Kylo strike down one of his own knights, she's not actually seeing Kylo doing it; she seeing herself do it, because in IX, Rey will don Kylo's costume at some point. The reason this possibility occurred to me, is because, taken at face value, it's hard to see the impact that the scene might have, given what happened in The Last Jedi. We can believe it's something that turned into "Kylo kills Snoke" instead, but that leaves the vision rather devoid of meaning. We can further believe that Kylo WILL kill one of the KoR to save Rey, but I think that's super redundant. He already betrayed someone close to him for her. I keep coming back to: it's Rey's turn to save him. So... maybe that's what the vision is in some kind of weird way? Bear in mind, this all presupposes there being a really tight plan from Day 1 of these films, but in any case, I thought it was an interesting idea (albeit one that simply came from the recesses of my weird brain, lol). 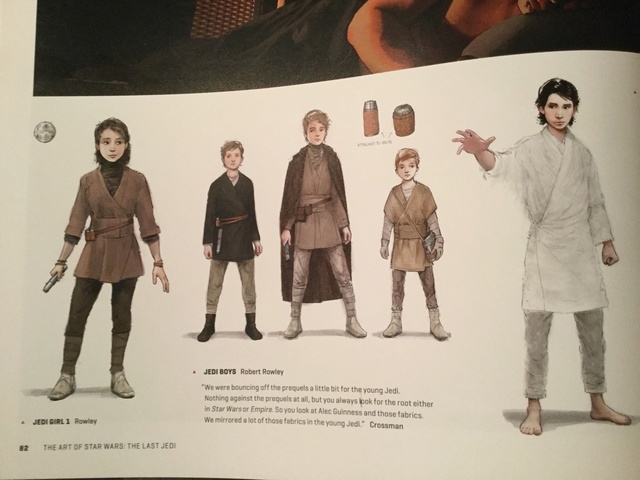 For example, there are beliefs that the vision was of the past, but Ben Solo still had unmodeled lightsaber, and the clothes were from a padawan. The only thing that coincides is that Ben killed some padawan and took others with him, the future KOR, in the Force vision see bodies, Kylo kills a KOR and then see others beside him. I hope that the vision is of the future, because it makes more sense, but mine are just speculations. I have a hard time imagining that JJ will not have the KOR in IX personally. I will not break down and make hate videos on YT if they are not, but Snoke and his “Kylo, Master of the Knights of Ren” in TFA and in TLJ is a bit much to just ignore it. I actually think that the force vision is not meant to show us a specific moment that will have any impact on the story. I mean Rey’s part with the ship flying off is also not correct. I think it’s just meant to show Ben has his gang and you do not want to be on their target list. I think PH, ages ago, had confirmed that the scene in the force vision was basically showing the KOR being naughty. Sure, it’s not set in stone until it’s in the movie. By the way, that Collider Q&A with Rian Johnson was interesting when the interviewer asked about the KOR, that we sort of know now that they are some of the former padawans of Luke’s and if they appear in IX. I have to listen to it again, but RJ was saying he has his theories and was avoiding to answer. Ok, it does not mean he knows anything, but that door is so wide open. Maybe too wide open and it’s a trap? I get the impression that the Knights of Ren are kinda like a biker gang in space. A very rough-and-tumble group of people, basically. I admit, the trajectory of the vision makes it more likely that it's a glimpse into the past (of sorts). If that's the case, then my best guess is that one of the main rights of initiation into The Knights of Ren (and also into dark side training) is killing one of your fellow knights. It makes sense that Sith training would basically amount to: "OK, kill your friend, and now your family, and now your soulmate/equal in the light." That doesn't exclude what I suggested actually happening in the film, but it might not be what's portrayed there. Part of me still wants to believe the Knights of Ren are one of the same with the Acoytles of the Beyond from Aftermath. I originally thought Pre-TLJ that Snoke would do away with the First Order when he saw fit, now I think this is more possible and more calculated and planned out. What if Snoke purposely had Kylo "kill" him in order to allow for Kylo to become Supreme Leader to create a further divide between him and Hux? This really makes the First Order weaker and if the Knights of Ren were to invade before the galaxy as a whole could gain enough support than this could truly create an everlasting Dark Side power sweep for the galaxy. This would also play into my original thought of the Resistance and First Order joining forces against them with the different gangs from TFA but now more so with Kylo seeking out Rey's help or else all hope will be lost forever. There's honestly so much potential and in my opinion, this is much better than Empire 2.0 versus Rebel Alliance 2.0. I like to believe the Knights of Ren are " the hand full of students" Ben left Luke's academy with after the "incident" and that they're loyal to Ben/Kylo NOT to Snoke. And even if they were kind of loyal to Snoke once- my take on the dark-siders are that they're opportunistic. Kylo killed Snoke so he is stronger/more powerful and now they're loyal to him. Survival of the fittest so to speak. I don't think they will play a very big role in IX - it would be strange after they were absent in the last two movies. Maybe more like the PG of Snoke. that what we saw in the vision of episode VII served only as a background, in a few words did not serve a purpose. @Night Huntress wrote: I like to believe the Knights of Ren are " the hand full of students" Ben left Luke's academy with after the "incident" and that they're loyal to Ben/Kylo NOT to Snoke. If they were to show up in the actual story, they would have to be like some have mentioned, someone for Kylo and Rey to fight, but do we really want to see them fight a group similar to the Praetorians again? And Kylo turning on his buddies from Luke's school is pretty depressing. Unless they all head toward redemption which would take emphasis off of Ben... I can't see them doing that. I think the KoR would be more likely to turn on Kylo once the truth about Snoke's death is revealed. But that's because I think, if they're going to be part of IX, that it'll turn out they were always more loyal to Snoke. I can see Snoke messing with multiple of Luke's students alongside Kylo more than young Ben Solo himself slowly turning people around him until they followed him. It's also because I can't see Kylo having truly loyal comrades out there in the galaxy. It wouldn't fit with the profound loneliness of his character and his feeling that nobody in the galaxy understands him like Rey does. So I can't imagine the Knights of Ren being Kylo's buddies and all defending him. Plus, would they pass up the opportunity to give Rey and Kylo some actual Force Sensitives to fight against? Though, and I said this in another thread, if J.J. follows through on Rian's hint about the KoR's backstory, I can imagine at least one Knight hesitating to turn on Kylo. They have history, after all. But I agree that focusing too much on that could be strange in the middle of all the other tension that desperately needs resolving. Between acting the Supreme Leader for at least part of the movie and reconciling his own past, dark side, and relationship with Rey, wil Kylo's arc really have room for a depressing plot with the KoR that explores their history? What's the source of this rumor? @ZioRen wrote: I think the KoR would be more likely to turn on Kylo once the truth about Snoke's death is revealed. But that's because I think, if they're going to be part of IX, that it'll turn out they were always more loyal to Snoke. I can see Snoke messing with multiple of Luke's students alongside Kylo more than young Ben Solo himself slowly turning people around him until they followed him. I agree. The bolded is something that makes me wonder just how the KOR would fit in Kylo’s story if they’re brought into Episode IX. I suppose if the KOR are going to be in Ep. IX, they’re either not going to be a large part of it or we’ll discover they’re not really loyal to Kylo, but to Snoke or something else. Perhaps they'll feel Kylo betrayed them either by killing Snoke or being unable to kill Rey. I agree with you @ZioRen that it would be weird for Kylo’s story in IX to suddenly focus largely on his history with the KOR when they haven’t even been in the story for the first two chapters. Especially when Kylo’s main conflict has been reconciling his past, the pull to the light and dark, and now resolving his relationship with Rey. It’s a prediciemt because I feel like the KOR need some kind of explanation, but they also need to be handled in the right way. If they’re well utilized, they could add some very interesting dynamics to the story, but their involvement needs to be coherent to the story that’s been told so far. One thing I suggested in one of my IX predictions is that maybe they knew they needed the Knights of Ren going forward in the plot because a) they're all established force-users and b) that's going to be needed if they're going to do a whole coup plotline in IX. They can at once turn on Kylo, overpower him (if he "trusts" them and they catch him unaware because they outnumber him), and maybe even possibly... impersonate him? It's a thing I keep coming back to that I seriously can't get out of my head for some reason. If they are also strong in the force, and schooled by the exact same two teachers as Ben/Kylo (Luke and Snoke), if any one of them put on the Kylo Ren helmet, what layperson would know any differently? No one except... Rey. When I think about it like this, I can see how they need them and will probably use them kind of unceremoniously in IX without delving too much into the backstory, and then saving the backstory for extra story materials. It's one explanation anyway. I think they're both Luke's former students and the Acoytles of Beyond mentioned in Aftermath. One interesting thing about the AOB is they were Darth Vader fanatics and obsessed with returning his lightsaber to him in death. Snoke hinted at a lust for the power of Ben's bloodline. So, it makes sense if the leader of the acoytles is Snoke. 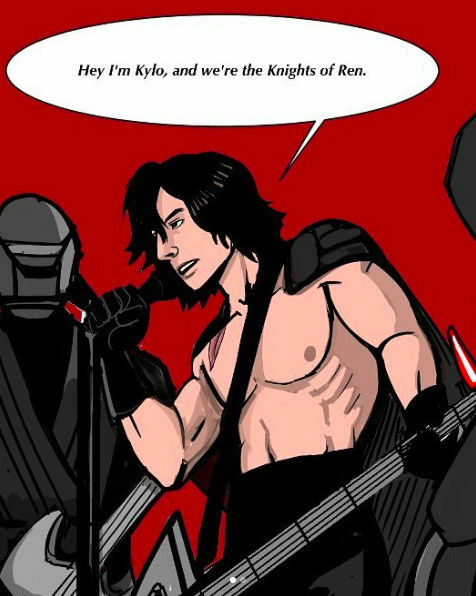 Adam also did say the Knights of Ren were around before Kylo and were that of a satellite group. So, it makes sense for them to be carrying out Snoke's bidding and possibly now training in the Unknown Regions with six other Masters carrying this out. I ended up chatting with some people, there is no source , they told me it's a false new. Even Mike zeroh doesn't have anything , they deleted the page, there is nothing. I'm glad really but are they already starting to put false news? I must admit that I am puzzled about KOR in IX. I was quite happy that some of Luke's students went with Ben but that is just because he was so lonely and it felt comforting to know at least someone besides Snoke (meh) believed in him. I am not the biggest fan of the fact that Rey is the only thing in the galaxy that is for Ben. The important, but not the only one. I would like for him to have some kind of support - someone who knows Ben and how he was before serving with Snoke. I guess if they had Leia in IX that could work with this, but now he is completely alone. I guess it fits with him being miserable in the path he has chosen, it's just so sad, maybe it should be like that and they should turn against him. I just like him to have his own little support group. I absolutely want the KOR and would love to see them being faithful to the new Supreme Leader, like the King and his (dark) knights. Is it confirmed as an absolute Canon that some of Luke's students went with Ben? And even if it is an absolute Canon, is the number 6+Ben correct? Just because we can count them in the vision? I do not feel that if an charachter say it in the VII or VIII, it is the absolute truth. Because they can tell the truth as they know it. As they are told. Or to hide something. We know Luke didn't tell Leia that he almost killed Ben? Luke was under the hut wreckage while the killing happened. So Luke is not trustworthy, and he is the only witness. IMO. And how many students was it in the Academy? Luke was the only teacher. How many could he have had? Ten? Twenty? Sixty? How bad a teacher could he be if 1/10, 1/2 or 1/3 of the students was turned to the dark in one night? I am more willing to believe Ben had 1 or 2 friends. It is not in character that he should have so many friends, and so good friends that would kill for him. All the students woke up when the hut came crashing down. The ones that really didn't like Ben draw their weapons first because they thought Ben had killed Luke, and he and his friend had to defend themselves, and they got lost in the rage and fear and "woke up" after the killing was over. Then it was too late, they had burned the bridge and could only go to Snoke. It is so frustrating. I feel that I know so little about them, and the Force Vision seemed so important. To just drop in the rest of the Sequel is like.... unsatisfying for me. A loose end. A very annoying one. Like when you chip a tooth and your tongue has to feel it all the time until you can get to the dentist and fix it. The TLJ novelization, isn't it written there that Hux only know about two force users, Snoke and Kylo? In the Fry novelisation (p147) Luke says...'he had vanished with a handful of my students and slaughtered the rest' - so no specific number. I would love for the KOR to show up in some capacity in IX for sure but if they don't I get they're lining them in some future outing with all the new films/ series the LF is working on. The film also has Luke say that Ben left with some students and slaughtered the rest. The exact number he went with isn't known but I can't see how it ISN'T a reference to the Knights of Ren. You ask great questions! I've had some time this morning to take a look at the KOR and just soak it all up.. I've gone back to the start of this thread and tried to piece together for myself what we know - and how we know it. Overall, it seems to me that we really don't know much! @Ramblingrose wrote: Is it confirmed as an absolute Canon that some of Luke's students went with Ben? -As far as I'm aware it is canon that luke had a dozen students and Ben. In TLJ Luke says to Rey: I took him (Ben), and a dozen students and began to train them. - this means there were 13 students all up. I think Luke would be reliable in knowing how many students he had! Then Luke also says: ...When I came to, the temple was burning, he had vanished with a handful of my students, and slaughtered the rest. -given Luke was under a bunch of rubble at the time - I think this is him interpreting the information he had once he came to. He knows he found some students dead. Slaughtered. But he doesn't actually know if the students went with Kylo/Ben or what happened to them. He is surmising. IMHO. it maybe true - but based on Luke's say so I can't be sure. I agree ramblingrose, Luke is not a reliable witness.. we don't know if this is accurate or not. The SW databank says in the snoke bio: "Ben destroyed Luke’s temple, left with several of his students, and slaughtered the rest. Snoke then became his new master." -Not quite the same language as the film but close. At this point, I can't find anywhere that says the surviving students joined Kylo/Ben - only that they left with him. Anyone? I'm thinking this number is based on the force vision in TFA yes. @panki wrote: In The Star Wars:The Force Awakens, The Official Dictionary, it is mentioned that " Rey is bombarded with force related sounds such as the voices of Mater Yoda and Obi-wan Kenobi and visions of the fearsome knights of Ren, led by Kylo Ren, who founded the order after falling from the light. " If the order was created by Kylo Ren, it is possible that the other knights are Luke's former students. I remember reading somewhere about the order being an old one...maybe Kylo re-established an ancient but defunct order of dark side followers. -ignore the Kylo starting the KOR stuff -it was an error in the book. 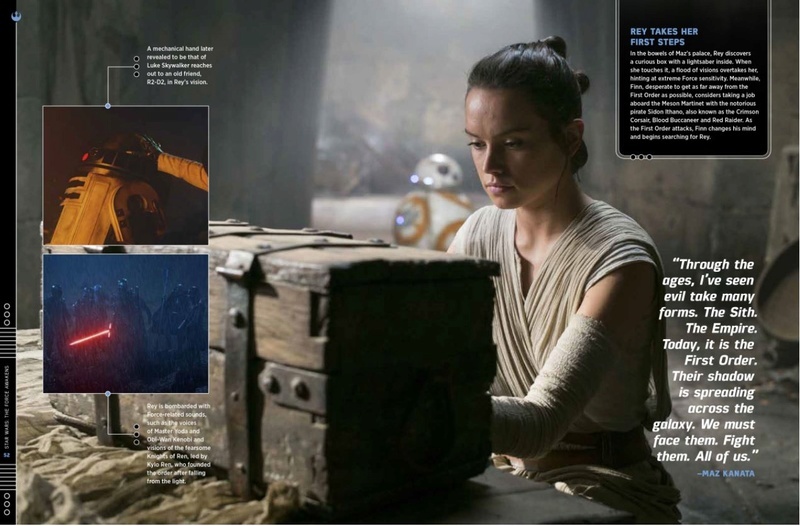 But - this page of the visual dictionary confirms it was indeed the Knights of Ren that Rey saw in her vision. This is the first place I've come across that actually confirms it is them! I agree! very frustrating! Fingers crossed we get a pay off in IX. When ANH came out we had talk of Jabba the Hutt but never saw him (in the original version) - and it wasn't until ROTJ that we met him. I would not discount the arrival of the KOR in IX - but their absence in TFA and TLJ would need to be explained.. I don't know - hope you get an answer to this from someone who has the novel! Kylo/Ben says: she is strong in the force, untrained but stronger than she knows. Snoke asks: and the droid? Hux is seen joining them: Ren believed it was no longer valuable to us. That the girl was all we needed. -it's possible Hux heard Kylo/Ben identify 'the girl' as being strong in the force. I would guess if Hux heard of someone resisting Kylo/Ben he'd be very interested! but umm anyway this is the KOR Thread! @Rimfaxe96 wrote: … Kylo didn't found them. They were founded about 20 years before he joined/a few years after the Battle of Endor if I remember correctly. This is interesting! Rimfaxe96 or anyone, where did we find this out? "Star Wars: Galactic Atlas is an upcoming reference book that will be published by Egmont UK Ltd in November, 2016. An atlas with full-color illustrations by Tim McDonagh, it will cover all seven Star Wars films, as well as Star Wars Rebels, Star Wars: The Clone Wars, novels, and comics. Explore the worlds and stories of a galaxy far, far away with this lavishly illustrated Galactic Atlas! Follow the beasts, battles, heroes and villains of the Star Wars saga all the way from the deserts of Tatooine to the ice plains of Hoth. A perfect gift for fans of all ages!" This book is being used as a reference for some information on Wookieepedia I don't think has been confirmed yet? I'm not sure. I first saw it on The Knights of Ren page where it is linked with the line: "The Knights of Ren slew Luke Skywalker's generation of Jedi." I also appears on the Destruction of Luke Skywalker's Jedi page. It lists them as "combatants" and says "The Knights of Ren destroy the new generation of Jedi being trained by Luke Skywalker." How the authors of these articles are drawing information from a book that isn't even out yet, I don't know. I guess some people have early access to it? I would like to see the original source material. 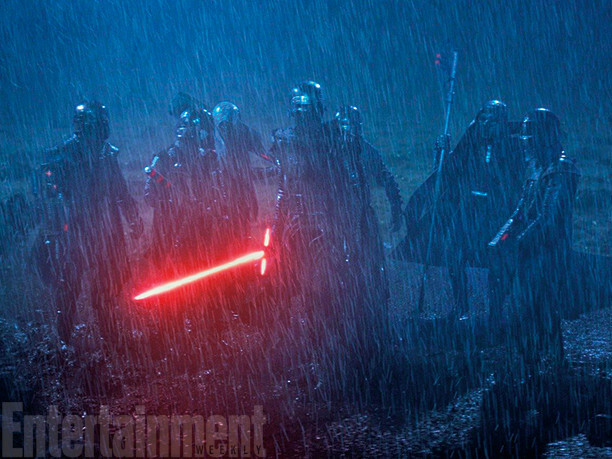 Has it been confirmed anywhere else that the Knights of Ren were present when Kylo Ren turned against Luke and his new generation of Jedi? It is something many have assumed, I believe, but has never been confirmed? However it is written in the Galactic Atlas might also confirm whether of not Luke's students were truly killed, since many are suspicious with word choice "destroy" in most references. It also shows Kylo Ren wasn't acting alone, if he did kill all the jedi. It wasn't like how Anakin massacred all the younglings all by himself, with them totally defenseless. It makes it sound more like a battle between two sides. The page lists the KOR and Luke's students as "combatants." I also wonder if perhaps Kylo Ren even had an affiliation with the Knights of Ren even before he finally turned against Luke. Perhaps his interest in them was what got Leia concerned enough to send him to Luke. I imagine it took some time for him the climb the ranks to "master of the Knights of Ren." It depends on if he was a leader or not at the time he turned, I guess. But if he was joining the Knights in battle against Luke's students, it sounds like he must've been at least somewhat familiar with them before that. Edit: It also looks like a really cool book just from the cover art, even. I kind of want it. @jakkusun - thanks for sharing jakkusun! Did you end up buying the Galactic Atlas? Does anyone have it and can share with us? Yeah wookiepedia is not reliable.. but it's something I guess. lol. It looks like wookieepedia has updated it’s Knights of Ren page – I can no longer see "The Knights of Ren slew Luke Skywalker's generation of Jedi." – looks like it’s been removed. Booo I only have the now out of date version. Anyone got this new version and able to share with us what it says? @rey09 - I laughed and laughed!!! Thanks so much for sharing this – so random! !